I found the following image & suggestion on Radio Times, along with the information that the Periodical Publishers AssociationÂ wants people to decide what’s the best magazine cover of the past 100 years. Considering that Radio Times has almost 90 years of existence and Doctor Who is approaching fast to his 50th anniversary, I ask you to vote for this cover of the century: the front page from May 2005. You can vote once a day, every day until 30 September 2013… so remember to visit the voting link as often as you can. 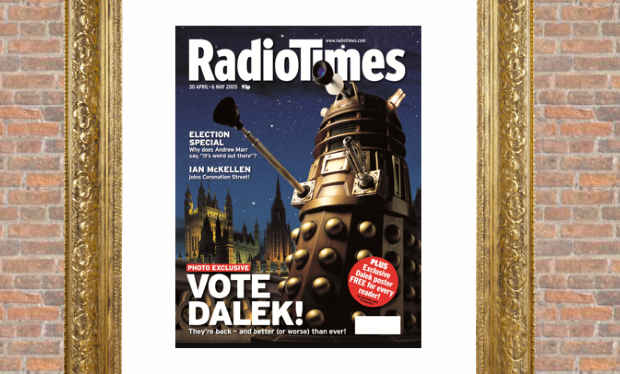 This classic Radio Times cover celebrated the Daleksâ€™ return after two decades away, coinciding with the 2005 General Election. We neatly brought these two events together by recreating a famous 1964 scene of Daleks crossing Westminster Bridge â€“ and had to clear coachloads of tourists to get the shot. A memorable image, topped off with the cheeky coverline: â€œVote Dalek!â€. Doctor Who News: <b>Vote Dalek</b>!